In the ScotRail franchise specification there are some requirements to help passengers make the most of the beautiful, and often spectacular, views from the train windows. Specially designed observation cars were run in Scotland as far back as 1956 when the pair of 1937-built cars for the high-speed London-Edinburgh service, "The Coronation", were rebuilt and transferred to the West Highland Line. 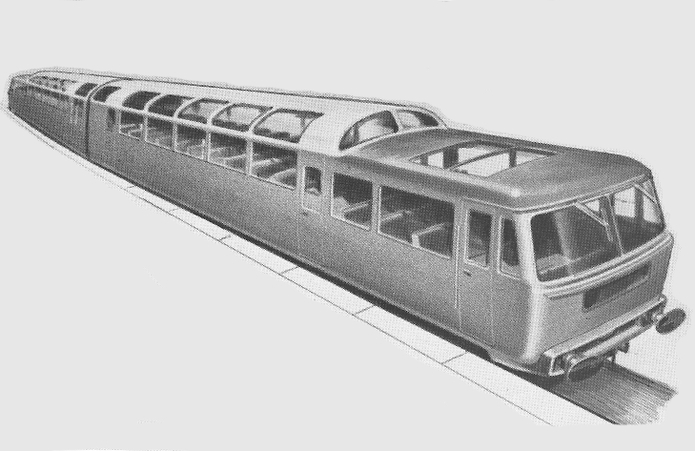 In February 1959 the small team of industrial design consultants, Wilkes & Ashmore, of Horsham, Surrey, were commissioned to envisage a two-car diesel multiple-unit observation train with a raised glazed section. The members of the team had come from the automotive industry after the Second World War and became well known for their innovative designs, in consultation with the British Transport Commission Design Panel, for several locomotive projects, including the ubiquitous Class 47. Unfortunately the observation train project was axed in an economy drive. Family resemblance to later locomotives, such as the Class 47s, and the short-lived Class 35 "Hymeks" is clear. Their designs conformed to the appearance preferred by British Rail's Chief Mechanical Engineer - cab fronts comprising flat panels with no obvious 'nose'.